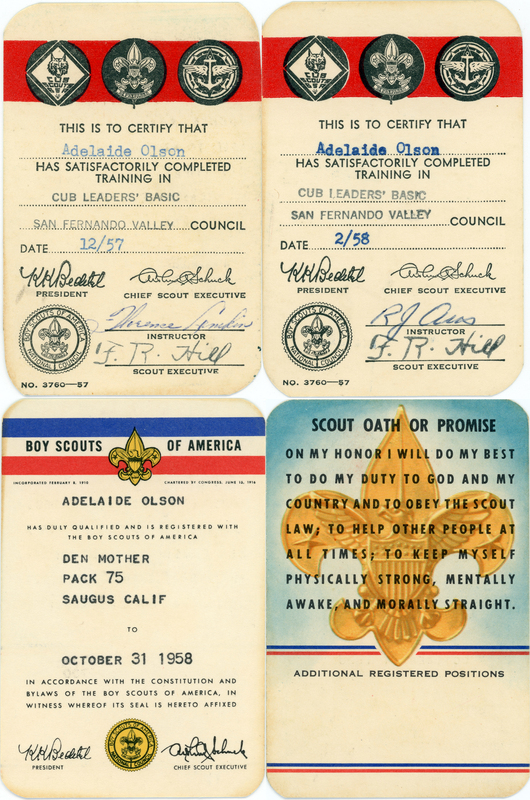 SCVHistory.com LW2872 | Organizations | Cub Scout Pack 75 (Saugus): Den Mother Certification Cards, 1957-58. Top: Two Cub Scout training certification cards for Adelaide Olson, 1957 and 1958 (blank on back). Bottom: Front and back of her Den Mother registration card, Oct. 31, 1958. Pack 75 was part of the Boy Scouts of America's Bill Hart District (Santa Clarita Valley). The Bill Hart District was a component of BSA's San Fernando Valley Council until 1972 when the San Fernando Valley Council merged with the Crescent Bay Council to form the Great Western Council, which was renamed Western Los Angeles County Council in 1985. *Note: We don't know if it is the same person, but there was an Adelaide Muriel Olson, b. Oct. 29, 1919, who lived at 15353 Iron Canyon Road No. R4 when it was considered Saugus; now it's Canyon Country. LW2872: 9600 dpi jpeg from original cards purchased 2017 by Leon Worden.